On today’s blog we give you a CEO’s perspective on Air. The interview held by Kevin William David was originally posted on Siftery (click here for the full version). 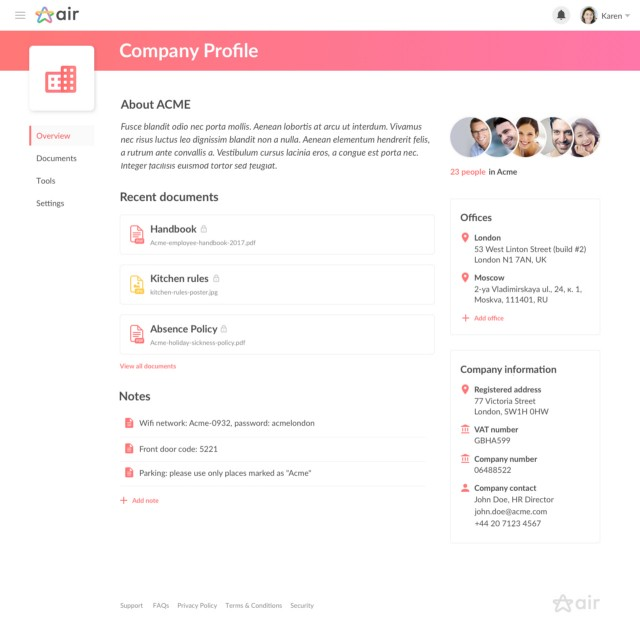 Air provides a simple, beautiful and connected HR software for small businesses. Air was born out of a personal frustration for how complex, time consuming and ineffective it was to maintain good HR practices in small businesses. 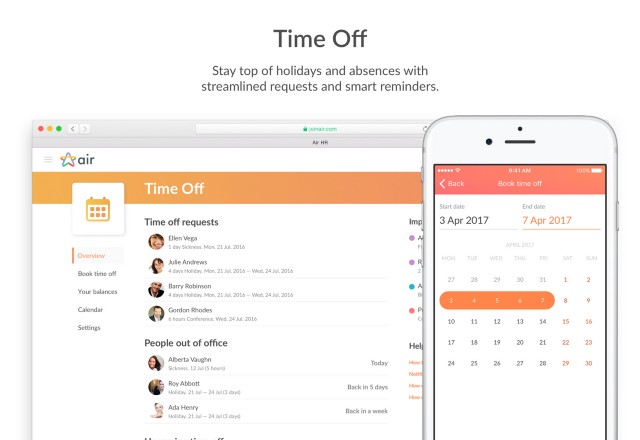 Air offers various HR features like a central employee directory, time off booking, smart notifications and native iOS and Android apps. Air has the flexibility to suit your needs — from time off management to expense reporting. Air is built around a “hub-and-spoke” model. A simple core for free with all the basic things that small businesses need and then the App Store allows businesses to extend the platform with native Air and best-in-class third-party extensions. Apps are connected so everything is in-sync and works together. Air is refreshing, easy to use and automates a lot of your HR processes. Essentially — Air is an HR platform that grows as your business grows. The team spent 5 years working together before — building tech startups like Whisk.com. We always felt that the HR admin could have been done faster and better and the solutions always felt badly designed or sometimes even entirely unworkable. After a while — we decided we’d build something ourselves. Businesses currently need to choose between antiquated full-featured HR software platforms or narrow best of breed, modern solutions. With Air this compromise isn’t necessary. Air’s biggest differentiator is its hub & spoke model, which makes a simple UX and powerful features possible together. Companies start with a simple, beautiful core and can add on the apps from the Air app store as and when they need features. With Air, companies save weeks of time on HR admin through the automation of simple tasks and elimination of data re-entry. Through the hub and spoke model, companies also have a single place to look at what’s happening across the whole people function of their business. Most of the companies using Air have between 10 and 100 employees — some have up to 150. Naturally for a software companies — a lot of our early adopters have a digital angle to their business — Agencies — Startups — Design Companies etc. All our customers use Air for storing their people records and managing their time off. Air means they can say throw away their spreadsheets and track everything in a simple online portal — we automate a bunch of stuff in Air and ultimately save companies a lot of time. Some stats say business owners spend 4–6 weeks per year on HR admin — it’s crazy. The second (and important as our differentiator) thing we do is through our app store. The problem in HR is that there is a huge long tail of features — let’s call it 100 features. Every company wants 2–3 features from the 100, but definitely don’t want all 100. Most HR software platforms have been on a feature adding spree — but building all the features is very difficult — so maybe they have half of them. Their systems are hard to use — and don’t do everything companies want. With our hub and spoke model we have an app store where we add native features built by us as well as third party extensions. Businesses can browse through it and add just the features they know they want. They essentially get a personalised, fully connected HR platform with a great user experience. In addition to our core, the most popular apps on Air are our expenses app and HR reports app. Our biggest challenge was building Time Off. Time off is *super super *complicated when you get into the detail and inter-dependencies. We totally underestimated how difficult it was to build and it took us months longer than we had expected. On the upside — we now have — I think — one of the best Time Off apps (feature) — in terms of functionality depth and UX. On the technical side — Air is built in React with a Scala back-end. We’re huge fans of react because of the simplicity in pushing updates to the web, iOS and Android at the same time or in quick succession. We love Intercom for customer support. The company are huge users of G-Suite — Google Docs, Analytics, Hangouts etc. Real-time collaboration makes everything so much faster internally and their products are awesome. We love Invision to share designs and get feedback on them. Xero is awesome to manage all our finances.